PT in Motion, Inc., proudly services children and adults for all their physical therapy needs. Winning the title as Top 10 physical therapy clinics in San Diego 2016, PT in Motion Inc has been recognized as best in town; they are also known for their caring atmosphere, especially in their pediatric specialty clinics. 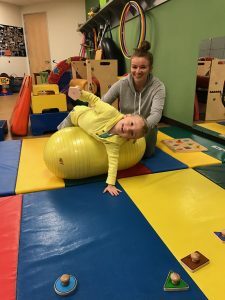 Pediatric therapy is an area of extreme specialty, which takes a therapist trained and experienced with a knowledge of normal development and subsequently abnormal development issues. CST is effective for conditions such as: Plagiocephaly, Torticollis, Reflux, Migraines/Headaches, Chronic Pain, Motor-Coordination Impairments, Stress and Tension Related Problems, Temporal Mandibular Joint (TMJ) Syndrome, Orthopedic Problems and many other conditions including autism and sensory issues. To learn more about CST, please call us at: 858-565-6910. Manual Lymph drainage and Multi-component bandage are therapeutic interventions that provide effective management of Lymph edema and other conditions such as Venous stasis, Lipedema and post-surgical edema. – And, decrease risk of Lymphangiosarcoma, resulting from the most-severe cases of untreated lymphedema. In 2016, PT in Motion was named as one of the Top 10 Physical Therapy clinics in San Diego. Recognized for not only taking care of the kiddos; PT in Motion, Inc, was given this award for clinical excellence in the general adult orthopedic population. We treat aches, pains, pre-surgery “prehab,” post-op rehab, custom wheelchair and seating assessments, custom foot orthotics, and we give free injury screenings as well! A condition of limited neck motion where your baby holds his head tilted to one side and rotated to the opposite side. This results from shortening of the neck muscles while in utero or with poor positioning. Now Also Offering at our San Marcos Location! At PT In Motion, we take pride in offering a healing environment, designed with a warm and friendly atmosphere where the staff take pride in providing one on one personal care. All patients, no matter what the age, or diagnosis, are made to feel comfortable and relaxed as they participate in therapy programs.